…the inevitable irony of Carhullan’s insurgency, and of Sister’s membership of its “army,” is that it leads her to repress others against their will, and even to kill in her turn. She becomes party to another administration of terror, and a willing subject of a dictatorial regime. Whether this terror, driven by Jackie’s autocratic paranoia, is necessary or justifiable is left unanswered; the answer being, of course yes and, of course no. It is the embodiment of an essential dilemma, perhaps the most pertinent of our time: is it more courageous to passively follow your principles unto death, or is it your duty to use the tactics of the enemy, however disgusting, to overthrow them? Is it acceptable or reasonable to use the methods of tyranny in the name of restoring or protecting civil freedoms and human rights? Either way, Hall understands that this dilemma is not an abstraction; it is the central difficulty of Sister’s existence and lies at the very heart of life at Carhullan. In the process of exploring it she makes and destroys and remakes Sister over and over again. Like us all, she is a malleable creature, eager to be inspired, happy to be galvanized to action, begging for a role to play in the world. The novel is an incredibly tender and multi-faceted portrait of her troubled journey, concerned almost entirely with the mechanics of her reasoning and her understanding of her cause. This is why, no doubt, Hall omits to describe the novel’s main scenes of violence and conquest—Sister’s narrative tapes are “corrupted” at all these critical junctures—but instead focuses on the tension of the long road to a short and bloody aftermath. Other reviews: Colin Greenland in The Guardian, Nic Clarke at Eve’s Alexandria, AI White at Open Letters Monthly, Rachel Hoare in The Independent, Michael Arditti in The Telegraph, Tom Gatti in The Times, Abigail Nussbaum at Strange Horizons; and more critically, Adam Roberts at Punkadidle, Karen Burnham at SF Signal, and Cheryl Morgan. 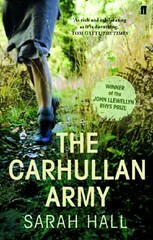 And as Adam helpfully pointed out yesterday, with impeccable timing Radio 4’s Book Club has just had The Carhullan Army as its subject; you can listen to the programme, which includes an interview with Hall, here, discussed slightly by Dan Hartland here. So: Eleven novels; nine writers, four Brits, three Americans, one American-Brit, one Canadian; three novels only published in the US, three novels only published in the UK, five novels published in both; four books published in 2003, the most recent nominee published in 2008; nine novels published as “genre”, two published as “mainstream”; two novels that at least some people think are fantasy. What do you think? Seems a very diverse list, and a strong showing for sf by women. Jo Walton is British-Canadian, not just Canadian. Which is why this list looks very British-dominated to me, cumulatively. That feeling is exacerbated by the major recent Willis novels being about London. There is nothing wrong with all this, of course. In any event, an interesting and though-provoking exercise which has given me lots of good books to look forward to! It seems like a solid list of great books. I’m definitely planning on reading some or all of the ones I’ve missed. I do find it somewhat surprising that some of the most well-regarded SF books of the decade didn’t make it on — Oryx and Crake, for example, and The Hunger Games. And I have to admit I’m also still surprised to see Lavinia on there as an SF book. The Hunger Games was right up there until pretty much the last day of voting, when other things overtook it. The UK presence is not quite as simple as lots of Brits voting for Brits — most votes for Life came from US resisdents, not surprisingly. I don’t know how Jones’ votes would have distributed themselves if all three books had been available equally in both regions, it’s possible they’d have clustered a bit more.